It’s time for the HEAV (Home Educators Association of Virginia) Convention again, and I thought it would be a good idea to re-share my posts to get you ready!!! Last post was all practical and humorous, but today I’d like to go back to the spiritual gut-check side of convention. Now that we’ve evaluated our “current” curriculum status, and “organized” the past stuff that needs to go, we really should take a moment and look to the future. Yes, even before we start deciding which grammar and spelling curriculum to use next fall. 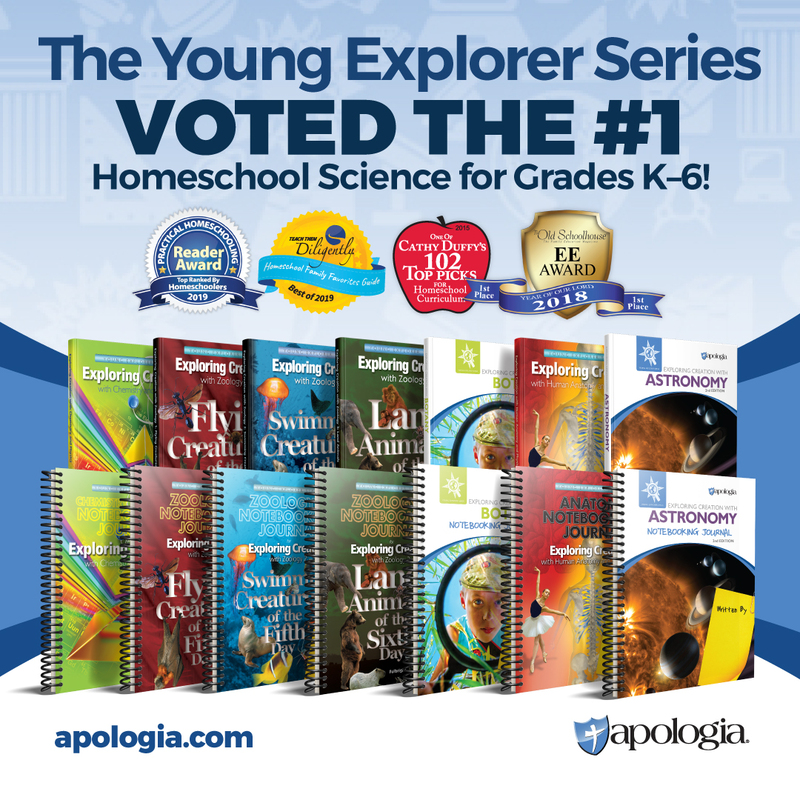 Think of this time as a great opportunity – it’s like the New Year experience for homeschoolers. We’re out with the old and in with the new. And with that always comes a time of reflection, of celebrating being done, and also making resolutions/goals for the upcoming year. Defining your purpose and vision (see, there goes my “Coaching” voice again) can be life changing. I know that going through this process each year, (pre-homeschooling), truly helped me clarify the driving priorities and purposes in my life. Step-by-step, I began to evolve into who I am, and closer to whom I’m meant to be. And oh, isn’t that what we want for our families? For our homeschool? For our children? So as a personal challenge this week, sit down with the hubby, a cup of coffee (or ice cream, whichever makes discussion go down better), and really just talk about these questions. Perhaps you might want to email him the link to this article ahead of time, giving him time to come up with his list of answers, and then you both can compare notes. And just since we’re already going there, I want to point out this article that I just read today. WOW. Powerful stuff. But really, has the “homeschooling” become the driving force in all that you do in your home? Sadly, I’ve seen several “discussions” online this week already that give me pause. Maybe because I’m leading a Bible study right now, entitled “No Other Gods” that I’m hypersensitive about this particular topic? Regardless, we still want to make sure that God is the ruler of our home, our lives, AND our homeschools. And once we, as individuals, as parents and as a family, able to truly envision that “better us” that God is ever developing, we can start to use that as our guideline. How does that information define your choices? Does it affect particular curriculum choices? How do you keep homeschooling within it’s proper order of priority in your family? What things might need to be reviewed and adjusted from last year? What can you simplify in your family to make it all work out “to the glory of God” in hopefully a less chaotic, calmer manner? How are you teaching “living in priority” to your children? Are they learning from your life or only your words? Yes, these are the things I’m contemplating right now – as I sit here and read reviews of 2nd grade spelling and grammar programs. Yes, here is Choice A, which everyone says is SO amazing, but they also say it’s very time consuming. Choice B is also good, but is more shorter time period each day. Which one fits with my “simplifying, calming, and loving/nuturing” atmosphere I long to create? Perhaps it’s worth it to use the longer time-intensive program and make cuts somewhere else. Or, do I really need all those extra curriculum enhancement programs I’ve found online? When is too much? Or when is the extra just so much fun you don’t want to stop? I guess what I’m saying is, this is a really good time to figure out where your lines seem to be drawn in the sand. Obviously I might not be able to figure out the answer to that grammar/spelling curriculum internal debate before convention, but knowing having our family mission statement and priorities organized, will make those decisions much easier and quicker. So, you know, you can enjoy everything else at convention! Are you following HEAV on Facebook? Do you know there are bloggers giving away passes to the convention in the next few weeks? Be sure to be following me on Facebook as well, my time to do a convention pass giveaway will be coming up very soon! I have to confess – I’m not “organizing and preparing” like I did last year. 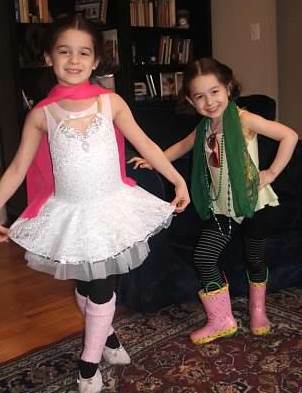 I have a few reasons – #1: We’re so far “behind” who knows when we will actually finish this year (this year has been the year of field trips and unscheduled days off due to sickness and Mommy’s job), and #2: We’re moving this summer. I have enough to deal with in organizing for that – I just can’t deal with with planning ahead for next fall too! I’ll organized the stuff I want to sell maybe next year. Actually, I do have some stuff planned – I’m looking at a well-recommended co-op in our new town, a friend and I are working out a trade for some of next year’s curriculum that she didn’t use, and I’ve already picked out our math (we switched mid-year). So, I don’t have any new major things to plan for. BUT, I still think this article has some great advice, and wanted to pass it along to all of you! Soooooooooo, in my last post, we talked about becoming spiritually ready for convention. After that, I’d say step to get ready for convention is to organize, evaluate, and consolidate! First of all, do you want to participate in the Used Curriculum Sale? Right now is the time to sign up and get ready! Start pulling all of your “old stuff” together for the sale, and get it priced. And then have a little weep over all the curriculum that you have to say goodbye to. 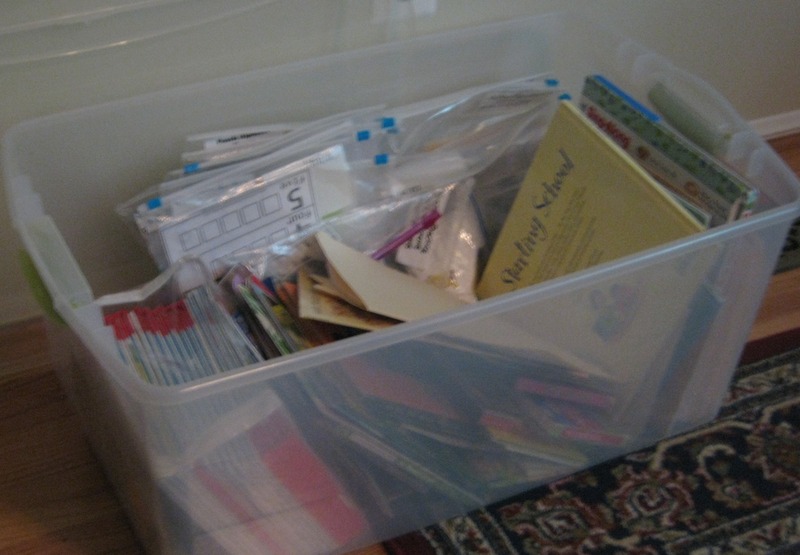 Goodbye MFW Kindergarten Curriculum (and random preschool stuff). Sniff, sniff. I just want to point out this is the only picture you’re getting in this post, and yes, I did crop out all the mess surrounding this picture! And this is where I just got stuck. I know this all needs to go, we’re completely maxed out already and we’re not going to be using it again. But oh, it’s just so hard to let go! I have such emotional attachment and memory attachment to these books and items! And I honestly just couldn’t handle the thought of the consignment process. If my kids were older, I might assign this to them as a project! 🙂 But, since they aren’t, I decided to forgo the consignment sale route this year (the selling – not the buying, LOL!) and I’ve floated around the idea of sending the whole kit and caboodle to a local homeschooling mom with up-and-coming kindergarteners. For me, right now, this is just a much easier option. That all might change next year though! Now that the old is gone, evaluate what is left. Have you pre-bought/pre-collected items for next year? Get them together and see where the holes are. Any missing gaps? Make sure you make a note of it for convention. Have you made your decisions for your curriculum for next year? Where are your continued question marks? Any wish lists? To add to that list: any questions that you really wish you can ask for help on? Last year there were “Curriculum Doctors” and they were the absolute sweetest ladies on the planet. So calm and so reassuring to this new homeschooling mama, AND they had such great ideas for me – at the time we were stuck at the dreaded “Addition Math Facts” hurdle. To the point where I’d been calling my mom begging her for advice! And the rest of the folks at the HEAV convention? From the volunteers manning the “new to homeschooling” booth to the vendors in the exhibition hall? Just awesome. Learned so much that I’m surprised my head didn’t explode. This is just a simple note to say that this is a good time to get all of this wonderful pondering and prepping organized in one place. In some sort of fashion that would make it easy to carry around the convention hall. Because you know you’re going to forget something and just want to give yourself a good head-slap. Or you get home and realize you bought things you don’t end up needing. Like a particular book on my bookshelf that I have bought THREE TIMES. Because every time I see it I buy it, forgetting that I’ve done that twice already! Or, ya know, you already have six-zillion different science experiment idea books on your shelf, you really don’t need the five more you impulse-bought at the exhibition hall. Ya know. Or, the REALLY IMPORTANT QUESTION about math curriculum that you only remembered to ask the last two hours of the convention, so you have to race around looking for that particular person who is the perfect person to ask, that you already had the half-hour conversation with the day before? Ya know, that sort of thing! Not that I’m talking from experience, of course. Not at all! And also, that might just help a little with the house being too complete of a disaster to even take pictures issue. Not that I’m speaking from experience there, either. Oh, and please, if you haven’t already, STOP RIGHT NOW AND REGISTER. RIGHT NOW! And then, BOOK YOUR HOTEL ROOM IF NEEDED. 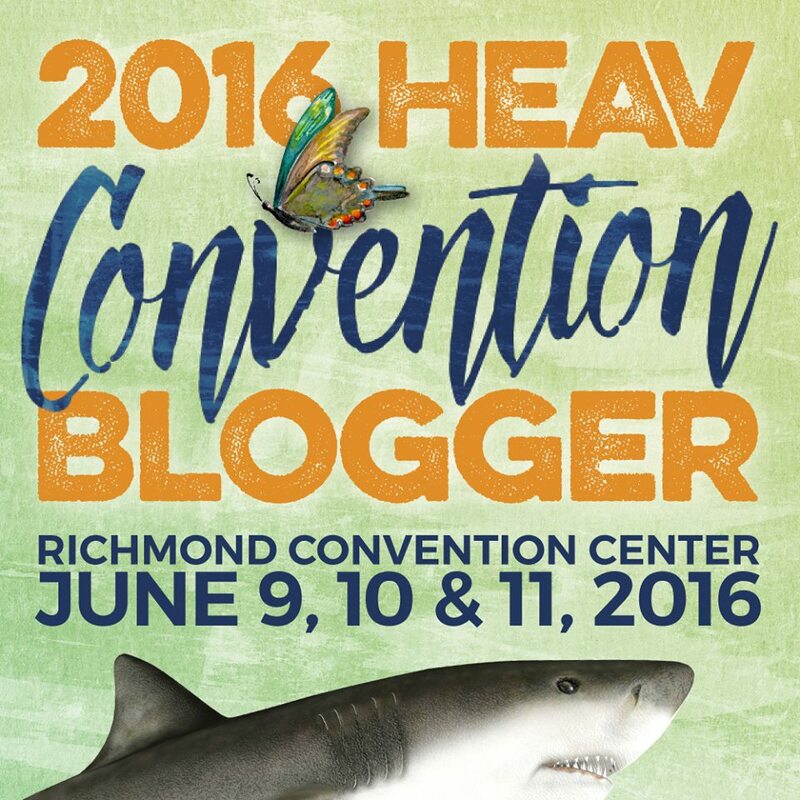 Just a FEW Weeks to the HEAV (Home Educators Association of Virginia) Convention! Are you guys excited?? Reading a post from the 2:1 Conference, I thought it might be a good idea to talk about getting ready for the upcoming homeschool conference. In previous First Things First posts, I’ve talked about the idea of making sure we put Christ first in everything we do. And I really like the idea of practicing what I preach to my girls as well – if I say I want to put God first in our homeschool life, then just maybe I should start putting him first in my preparation of it as well! So that’s my challenge for YOU this week. Are you putting God FIRST in your homeschool preparation? Before the research of curriculum choices, before the sorting and organizing for the Used Curriculum Sale, before asking a zillion other homeschool moms their opinions on various programs — Have you put FIRST THINGS FIRST? Please take some time this week and prepare your heart with God. Spend time getting His input on your children’s education! Pray that you will continue to “Seek ye first the Kingdom of God and His righteousness” even before advanced “education.” Beg the One Who Sees All to open your eyes, so that you can see the vision as well, and the road before you. Ask that He prepare your heart before you arrive, so not only can this (not-so-little) homeschool convention be MORE than just about “school.” May this be a time of rejuvenation, of strengthening, of clarity, of encouragement. Oh, and of fun! Nothing wrong with asking that God help you truly enjoy your time there! Each week until the HEAV Convention, I’ll be posting more thoughts on getting prepared! Stay tuned!!! It’s been a CRAZY year this year. Oh my gosh, HOW INSANE. 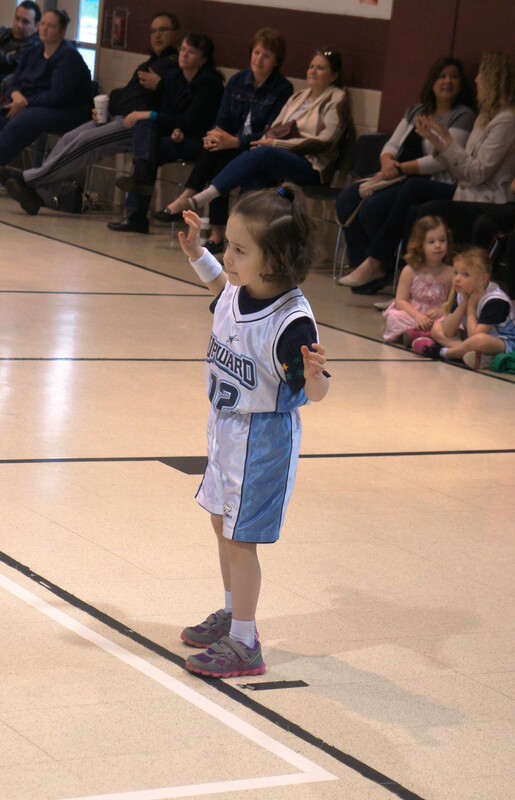 And of course, we decided to make it even more insane by putting our girls in Upward Sports this winter. There went our entire Saturday EVERY Saturday, for the past three months. But they loved it. LOVED it. Sigh. At least it counts as PE, right. In the midst of all this, I’ve been working more than should be humanly possible, AND we’ve been trying to crank through as much homeschool as we could. We have a bit of a self-imposed deadline due to our upcoming move this summer – which I really don’t think we’re going to meet. Sigh. I would really love to not have to do homeschool in a hotel room and while dealing with relocating. Might not be possible though. That truly has been the extent of our lives for the past few months. Not too much exciting to share or report. Oh, but I have to share this cute picture. Our youngest was reading the story of Joseph in her Bible reader (My Father’s World 1st grade) and drew this picture. Notice she labeled him “Jose.” Ha! #SpanishSpeakersUnite! Now that Upward Sports is over, I can try to catch up on all my blogging here, AND start getting ready for our move and for HEAV’s homeschool convention! You’ll be seeing a lot about that in upcoming weeks, so stay tuned!